Communications Improvement | HRS Consulting, Inc.
Communications is the critical factor that often defines the variability in the course of a complex process and an organization. HRS Consulting has the HRO experience, tools and systems to drive and sustain documented improvements in Communications. Analyses consistently show that communications breakdowns are a common cause of unexpected results. In healthcare, communication failures are involved in most sentinel events and the numerous hand offs in healthcare are all points for communication failures. 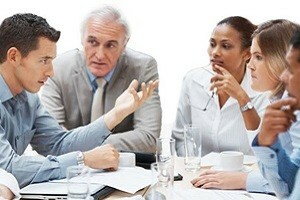 Effective communications skills are critical to improving the performance of individuals, teams and organizations. Our consultants have adapted this training to meet the unique needs and appropriate communications styles of each client organization. We offer the following services to help organizations and all levels of employees understand, learn, and practice effective team communication skills.